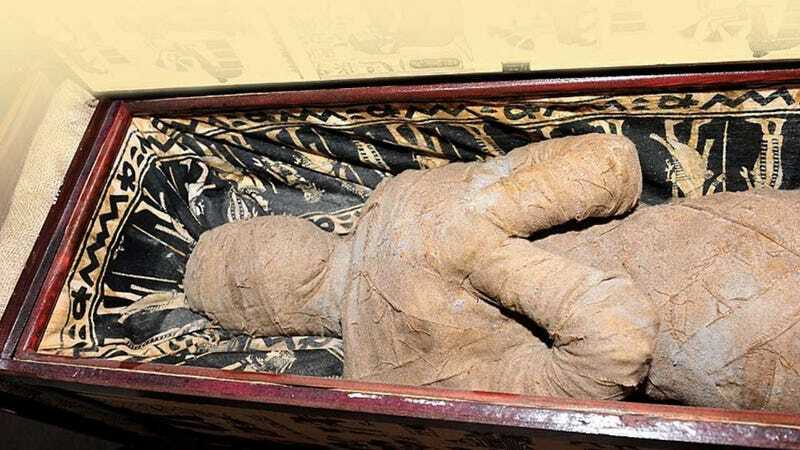 Early last month, a ten-year-old German boy found a mummy in his grandmother's attic. Many considered it a hoax. But a radiological analysis shows that the mummy contains actual human bones, though probably not from an ancient Egyptian. The find could open a criminal case. According to the German newspaper Kreiszeitung, CT scans and X-rays revealed a fairly intact human skeleton, including a skull with an arrowhead lodged in one of its eye sockets. All of the bones, except for the skull, are wrapped in a kind of metal foil, which will make further X-ray analysis impossible. The skull is also wrapped with a metal diadem, a kind of headband worn as a symbol of sovereignty. The skeleton itself is completely missing its neck vertebrae. Experts suspect that more than one body was used to make the mummy. The artifact was discovered early last month in an attic in Diepholz, Germany, where it had lain for decades. The house owner's son, Lutz-Wolfgang Kettler, assumed that his father brought it and other souvenirs back from his travels in North Africa during the 1950s. Unfortunately, his father is deceased. It's obvious that this isn't your typical Egyptian mummy. The 4.9 foot (1.49 meter) mummy likely dates back to the 20th century, and was probably made from machine-made linen or cotton bandaging. The mummy expert is baffled by the metal covering the skeleton, however. "Someone went to a lot of trouble to wrap the bones in this covering," he says. "Perhaps because they anticipated an X-Ray examination, because this is definitely a hindrance." A mystery that persists is who prepared the remains, and when. And that is a question that may interest police. On Tuesday the Kreiszeitung reported that authorities had confiscated the mummy, which Kettler had been storing in his garage. It will now be examined by forensic experts in Hamburg, the paper said. "If it turns out that the death occurred 3,000 years ago, then we won't pursue the case any further," said Jann Scheerer, spokesman for the Verden public prosecutor's office. "But we will if the person responsible for the obviously violent death could still be alive." As the owner of bones of uncertain provenance, Kettler has mixed feelings about the authorities getting involved. "It's a somewhat uncomfortable situation," he admits. "I insist on further examination." The 53-year-old is mostly interested in how his father acquired the mummy. He'll never be able to ask him himself, however, because his father died 12 years ago. One possibility is that the peculiar North African souvenir was a macabre hoax. "My guess is that someone played a huge joke," says pathologist Nerlich. Kettler is mystified, and sees it as his duty to find answers. "I am asking myself why the sarcophagus was stored in such a hidden place, and why no one ever spoke of it," he says. So, what is it? An elaborate hoax? A murder? Or some kind of bizarre ritual? The mystery deepens.